Today, while heading towards Acapulco, I stumbled across a troop of artists at work beautifying my lovely industrially abused neighborhood of Greenpoint. They call themselves Concrete Alchemy, and they grace us with their presence temporarily; performing their graffiti wizardry on the Power Brake Service Incorporated building only by chance. The Alchemists were only in town to ‘bomb’ a huge wall at 55 Pearl Street in Dumbo, and then split. Seems as if, this team of artists on tour had complications that prevented them from departing Brooklyn to their next scheduled destination of Princeton, NJ. Jersey’s loss, but then when doesn’t Jersey lose. As luck would have it, the graffiti Gods intervened blessing the crew with another Brooklyn wall to paint, this time in Greenpoint. 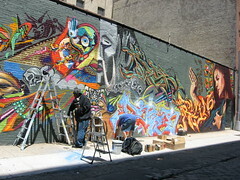 Though the thought of a graffiti tour in the storybook college town of Princeton is a great one. It’s not to be. Instead, we Greenpoint dwellers get to enjoy the benefits of Concrete Alchemy’s artistry…at least until the grime covers it up. ~ by Andrew Harris on May 18, 2008.